Yesterday, I had the opportunity to see the new Argonaut VI and Model 418 100 Watt amplifier up close and even operate them. Though I’ll keep my comments short–I have a l o n g day at the Hamvention ahead of me–I thought I’d share a few first impressions. The guys at Ten-Tec were kind enough to allow me to take a few shots of the Argonaut VI and the Model 418 Amp, both in Hara Arena and at Four Days In May yesterday. 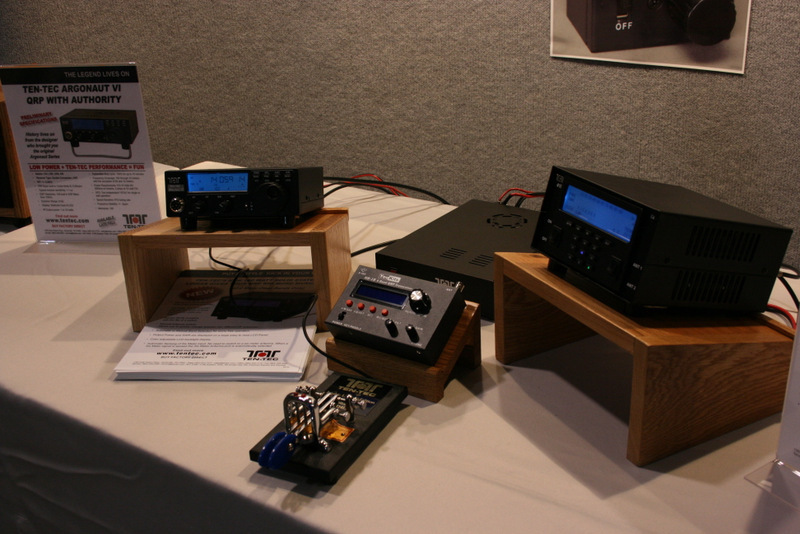 If you’re coming to the Hamvention, you will want to stop by the Ten-Tec booth. Through some sort of feat of engineering (or–as I first thought–dark magic!) they have a recorded chunk of 20M spectrum taken from a recent contest. They’re feeding most of their rigs with this spectrum IQ and you, in turn, hear exactly what each radio will sound like. Not only that, but you can operate the radio as if “live”–tuning, adjusting filters, bandwidth, notch etc. Indeed, you can use any receiver feature on the rig. Additionally, they have one of the Argonaut VI’s hooked up to a Model 418 Amplifier. With these two linked, you can operate CW into a dummy load. Through this set-up I got a very good idea of how the Argonaut VI sounds and how well the amplifier works in conjunction. The knobs, buttons and all features are quite easy to operate. The filters (especially as tested in CW) are simply amazing. I think they are comparable to the Ten-Tec Eagle. I like the size–slightly larger than an FT-817, much smaller than the Argonaut V.
All of the important controls are right there on the front: AF/RF Gain, Bandwidth/PBT, Power, RIT, Memories, Split, etc. Nice touch: On transmit, the red dot in the Ten Tec Logo lights up on both the Argonaut and ‘418. See photos below. Not many criticisms yet, but mind you, these are first impressions. Though the Model 418 was hooked into a dummy load, I was able to get a feel for how well the amp responded while sending CW. I’m happy to say that the QSK is silky smooth. 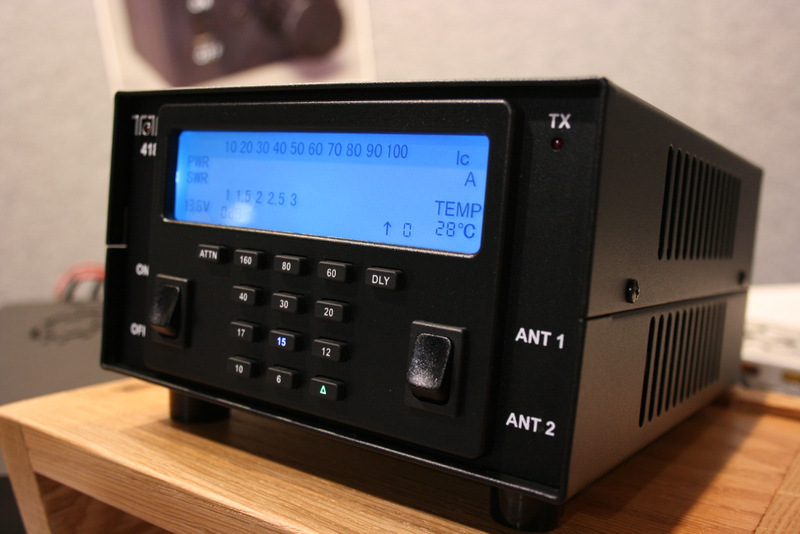 Ten-Tec has never disappointed me on this point–their QSK is a benchmark. Tomorrow, I will post the price of the Model 418 Amplifier–as I mentioned before, the Argonaut VI pricing is at least a few months off, most likely. Many of you asked about the omission of 12 and 60 Meters. I asked Ten-Tec about this and, in short, it was a balance of performance vs. features. Through their research, they found that 12 and 60 would be the least missed, while 160M would be a great addition (initially, they did not plan to add 160M). In an effort to save time, I’m simply posting a load of photos below in a thumbnail gallery. Simply click on the thumbnail to enlarge each photo. Feel free to comment and ask questions if you can’t make it to the Hamvention. I will do my best to answer. This entry was posted in Announcements, News, Product Announcements, QRP Radios and tagged Model 418 Photos, Model 539, QRP, QRP Amplifier, Ten Tec Argonaut 6, Ten Tec Product Announcements, Ten-Tec, Ten-Tec Argonaut VI, Ten-Tec Model 418, Ten-Tec Model 418 100 Watt Amplifier, Ten-Tec Model 418 Photos, Ten-Tec Model 539, Ten-Tec QRP. Bookmark the permalink. Already own the Eagle…..Very nice…. of that little one…. I hope not too heavy…for real portable use…. Any idea ? you mean, just like an SGC SG-2020, but without 160 and 12m?